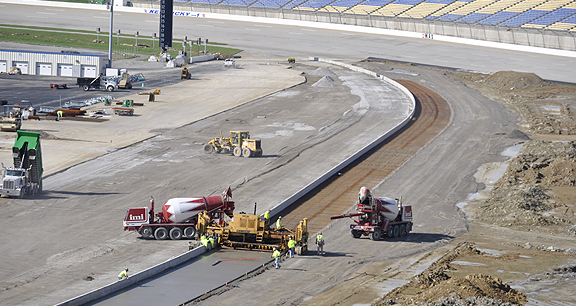 Project obstacles and solutions: In August 2010, Kentucky Governor Steve Beshear announced that the NASCAR Sprint Cup Series Quaker State 400 would be run at the Kentucky Speedway on July 9, 2011. With the announcement came a number of changes made at the track to accommodate 51,000 more seats. This included moving the pit area, constructing two new towers with grandstands, new access roads, sidewalks and parking lots. Baker Concrete Construction was given the contract for the concrete work. With a job of this scope and public awareness, it was important to stay on schedule. Cold weather threatened to delay the concrete work, as set times for some of the form work and finishing took longer than was scheduled. The forms had to stay in place days longer than was anticipated. IMI was able to help make up lost time in two ways. First, a change order was approved to replace welded wire fabric reinforcement to be used in the grandstands and walkways with macro synthetic fibers. Since the fibers were integrally mixed in the concrete, there was no need to take time to prep and place the welded wire fabric. This was a huge time saver. Secondly, IMI technical services were able to adjust Portland cement blends to speed up set times without compromising strength. This allowed the finishers to stay on schedule and proved to be critical in meeting construction deadlines. IMI delivered 12,000 yards of concrete to the site. Baker Concrete finished seven months of work in May 2011 on schedule.